Last time not worn: Technically 2011, though only because Wainwright was out all year with Tommy John surgery. So actually 1996. I’m the first to admit this isn’t an original idea. Using player numbers as a countdown to Opening Day or the start of spring training has been done numerous times before. In fact, every year over at Cards Clubhouse they get this thread going and this year is no exception. Still, it’s a fun and potentially informative way to look back at the greatness that is Cardinal history while waiting with anticipation for another season to begin. When you look over the list of names, there’s no doubt that Wainwright had to be the guy to kick this off. While Henke’s year in St. Louis was a personally successful one, he’s a bit of a mirage, the legendary closer that came to St. Louis for one year, then promptly retired and hasn’t been heard much from since. All of us with enough age under our belts remember Haren and we have no need to revisit the Mark Mulder trade yet again. Besides, Haren shifted to 55 in 2004, his first full year with the squad. 50 means Wainwright and it likely always will. 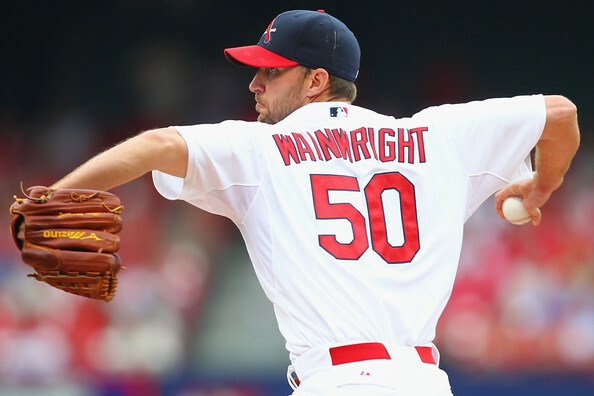 Whenever Wainwright retires, 50 is going to be put in storage for a while, the way nobody has worn #5 since 2011. Wainwright’s not going to leave under that kind of cloud–he’ll likely retire as a Cardinal–but he’s still going to garner that kind of respect. If the Cardinals hold to their policy of not retiring numbers unless the player goes into the Hall of Fame, it may never wind up on the outfield wall (although there’s still time–it well might) but it’s going to be legendary for every generation that comes after this. Parents and grandparents are going to talk about that big 50 being on the mound when the 2006 World Series was won, how he was a perennial Cy Young candidate, how he was the horse for one of the best runs in St. Louis history. It’s only fitting that we start this series with Wainwright. After all, we’ll be ending it with him on the mound, throwing the first pitch of the Cardinals’ season! Previous Post: #TBT: Remember These Arguments?